Deer symbol is often found inthe mythology of the ancient Slavs. Black and white deer symbolizes winter andsummer, black deer brings death and misery, and the golden-horned one promiseswealth and bright future. 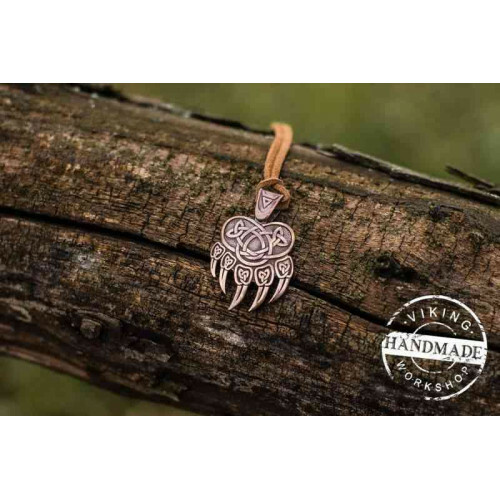 Deer was a patron of families and lovers, and wearinga deer pendant helped to strengthen the bonds of marriage and avoid adultery. This amulet is not to beconfused with the classic Perun Axe, which was usually used byhunters and warriors. The popular Svadebnik is a much closer symbol. Svadebnik ring as well as the Perun Axewith Deer, is a powerful family talisman that helps to create a strong bondbetween the male and female principles. Exclusive replica of Perunaxe deer is now available in viking-workshop studio! What are weoffering? Handcrafted product made of precious materials: silver, yellow andwhite gold (the customer chooses the material and size of the product, and onlythen the production process begins). We do not use any industrial equipment of mass production in creating Perun axe deer amulet: all stages,from project development to engraving and packaging are carried outindividually and in constant communication with the client, thus you can makeany changes, order an exclusive engraving and discuss all the finer points ofproduction with our craftsmen!